Sharing a Coke with a mate or drowning in the bubbles of narcissism? The campaign kicked-off with personalized name labels on Coke bottles. See http://www.shareacoke.com.au. 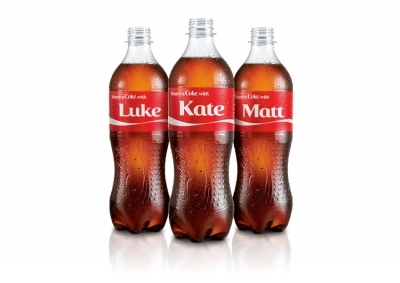 Coke has utilised an age-old marketing strategy of personalisation. It positions the campaign as being about sharing with your friends. In reality, the human behavior is quite different. Just like in group photos, everyone looks for themselves first. The appeal of seeing your own name in print on a global brand such as Coke is pretty enticing. I have no doubt consumers will buy personalised Coke bottles for their friends also, but only after they have searched for their own name first. The social media effect has also been extraordinary. People are proudly publishing photographs of themselves with their ‘prized’ personalised coke ‘buddy’. I imagine the Coke sales and marketing teams have also become best ‘buddies’ as a result of this campaign as it has achieved a rare success in social media/viral campaigns. It has gone beyond merely creating brand awareness – or even preference – it has crossed the chasm and driven direct sales. By doing this, Coke is reaching a new market. Consumers who wouldn’t normally buy a Coke are intrigued enough to search the supermarket and grocery store shelves for a Coke bottle with their name on it. In their mind, they are doing it just ‘for fun’ and the novelty factor. Most are probably aware they are responding predictably to a well-orchestrated marketing strategy. They just don’t seem to care. They have become ‘brand advocates’, providing free marketing to a global corporation. Whatever you think of Coke, their company, marketing or product, this campaign is clever and on all accounts is producing extraordinary results.